A few weeks ago, Half Pints released their first ever mead, Heidrun's Sweet Mead - which I've been able to sample a few times now and damn - it's a real treat. Half Pints isn't the first brewery or winery in Manitoba to make a mead, in fact - Killarney's Rigby Orchards has been making meads for many, many years now. They are also the only winery/brewery/spirits factory in all of Western Manitoba. I keep forgetting to try Rigby Orchards' products - mainly because I'm not a wine fan.. but after trying a few yummy meads out in Quebec over the past few years, meads are growing on me.. slowly. 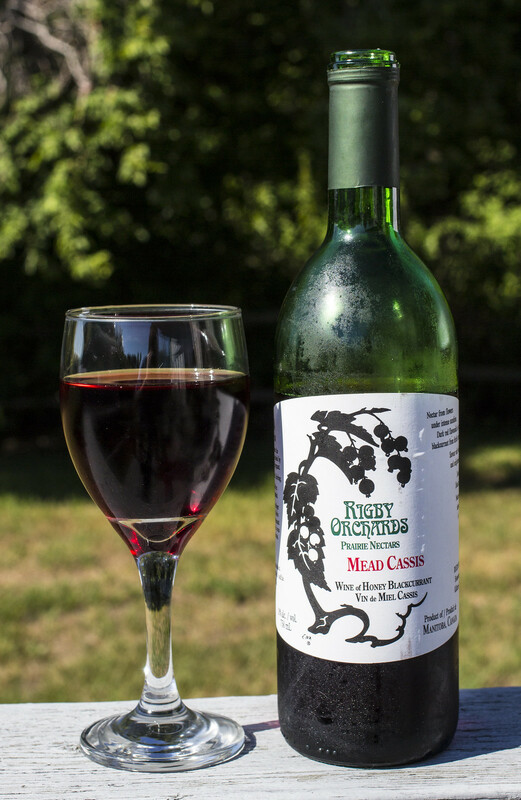 Today I'm checking out Rigby Orchards' Mead Cassis. It's been a while since I've had cassis anything.. When I was living in Quebec City back in summer 2006, I visited a small family owned winery on île d'Orleans and fell in love with their cassis wine. Then for several years Unibroue had their Éphémère Cassis which was a real desserty treat of mine when I wanted a sweet & tart beer. So as you can tell, I'm a bit of a fan of cassis. Appearance: The Mead Cassis is a very bright reddish-purple mead, almost like a combination of raspberry and grape juice. Aroma: I'm noticing notes of cassis which is giving it off a tart aroma, a bit reminiscent of a red wine but not as strong. Notes of honey, something a bit floral and hints of vineyard. Taste: I was expecting more of a tart almost-red wine taste to it. It's fairly mellow.. yet.. yeah, it's a bit tart. I don't mind it. It has the flavours of cassis that I love - a tarty yet sweet dark fruitiness in it. Rich notes of honey - quite sweet and leaves a bit of a sugary tingling sensation on the tongue. Notes of vanilla are also present in this mead. Overall Thoughts: The main notes I'm getting from the Mead Cassis is the cassis itself, leaving a rich, tarty almost-like-a-red-wine but not dry as hell sensation on the palate. It's a bit creamy on the mouthfeel and leaves a bit of a grassy/leafy aftertaste. Decent mead that's a great 5-à-7 (Happy hour) alternative to wine.. and made in Western Manitoba! 10% ABV.